Most Toastmasters will have 2 questions. How will Pathways differ from the existing program? How it will affect me as a members of Toastmasters? This 2 part blog explains the existing education program and why it needs to be changed, what is Pathways and how it differs to the existing education program. Competencies: Toastmasters aim to help its members develop key competencies such as Public Speaking and Building Confidence. Tracks: Currently there are two training tracks available to its members; these two tracks are Communication and Leadership. Manuals: Toastmasters complete training manuals on each of their respective Tracks. For example a Toastmaster may begin the communication track by completing the ten speeches in the competent communicator manual. Levels: There are a number of levels that toastmasters can progress through on either path. These levels are competent, bronze, silver, gold and Distinguished Toastmaster (DTM). 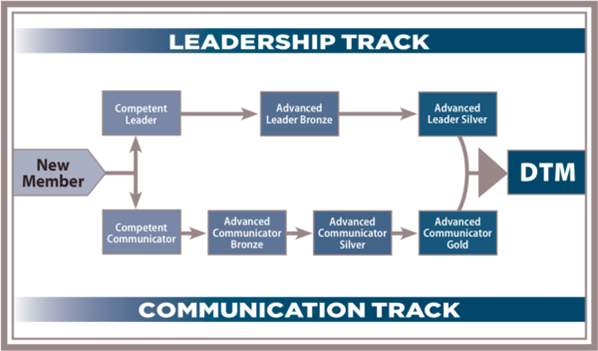 When a Toastmaster completes the competent communicator manual or component leadership manual, then they are at the component level of their respective path. Awards: Toastmasters receive awards for completing levels. A Toastmaster who reaches the competent level receives the competent communicator award. To elaborate a little further in the first diagram below it can be seen that a new member can begin the leadership or communication track. Each track has a number of levels before the a Toastmaster is eligible to begin the requirements to achieve DTM. Toastmasters can complete both tracks but the tracks are in no way integrated and the communication path seems to the be the most popular track. 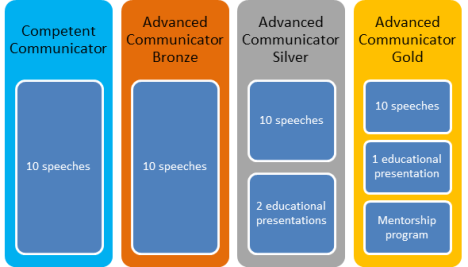 In the second diagram below it can be seen that a Toastmaster who is on the communication path must typically complete 1o+ speeches to complete each level from competent to gold. There a number of key reasons for changing the education program. Firstly the average length of a Toastmasters membership is 18 months but the the average time to earn a competent communicator award is 2+ Years. This results in less than 10% of members earning any award. Integrated Communication & Leadership, members want to develop both communication and leadership skills. Recognition sooner and more often. Real-world applicability, Toastmasters want to use their skills in the workplace and beyond. Modernization of content, inclusion of modern skills such as podcasting, blogging and hosting of web based meetings. Also the inclusion of the internet as an education platform. Relevance to Generation Y and Z, Toastmasters must stay relevant to upcoming generations. The success of TED Talks is representative of the demand for a more progressive approach to public speaking.